With a semi-raised saloon, this 82 is light, stylish and practical. The interior finish is teak wood in a hand rubbed satin finish with soft furnishings in cream leather. From comfort to technology and entertainment, our aim is to make your charter as enjoyable and memorable as possible. Below decks, the interior is both spacious and functional providing a living area designed with typical Swan elegance. 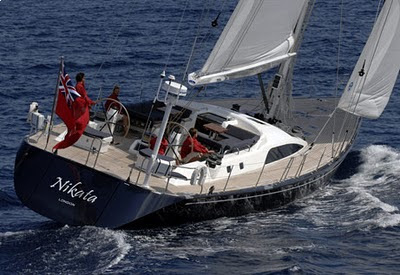 ‘Nikata’ provides stylish luxury accommodation for 8 guests in 4 cabins with 2 doubles and 2 twins. All accommodation has en-suite facilities complete with luxurious bathrobes, towels and toiletries. Individual flatscreen TV’s and music centers are fitted in every cabin and Playstation 2’s will help to entertain children. The crew accommodation is forward of the galley and provides total separation for your privacy.